Jody and Loren Hulber, long-time patrons of the arts, believe that richness in life comes from cultivating and sharing personal expression and creativity. The décor of their home reflects their appreciation for the arts with their collection of art by local artists. Their admiration for the Boyertown bears of the Bear Fever Community started the first time they drove through the quaint, historic community. They were familiar with the fiberglass animal forms, since they formerly lived in Chicago—the home of Cowpainters LLC, the company that creates the molds for such projects. However, it was the enthusiasm and collaboration of artists, sponsors and members of the community of all generations, as well as the leadership of the Stahls, that impressed them the most. “We celebrated our 25th wedding anniversary last December 21st, and Jody suggested it would be a wonderful way to commemorate our anniversary by sponsoring a bear,” Loren said. 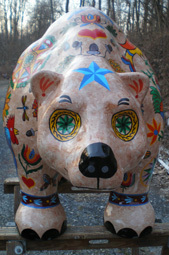 Hul-Bear was unveiled for public display on April 18, 2009, at the Hard Bean Café, Boyertown, during the annual Building a Better Boyertown’s Coming Out of Hibernation event. 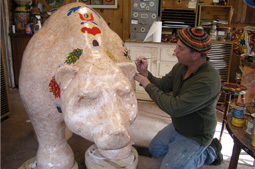 Since Hul-Bear is the Hulbers’ anniversary gift, they will permanently mount the completed bear at a prominent spot at their home, Fieldstone Farm, located in Upper Milford Township. 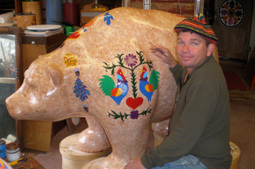 Because of their respect for the history and culture of their property, the Hulbers wanted to have a bear reflect this heritage and asked pre-eminent hex sign and barn start artist, Eric Claypoole, to design and paint Hul-Bear. The Hulbers met Claypoole at the annual Kutztown Folk Festival last summer and admired his skillful painting. Claypoole of Lenhartsville, has been painting hex signs and barn stars since he was a child when he helped his father, Johnny Claypoole. His father learned the art from Johnny Ott, a well-known Pennsylvania Dutch artist in the Berks-Lehigh County area. Other designs include hearts, tulips, roosters, butterflies, cardinals and dragonflies. As Claypoole explains, each design is symbol—hearts represent love, tulips mean faith and the roosters represent the fancy chickens on the farm. 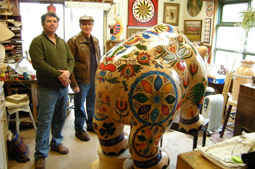 Eric Claypoole: Visit www.claypoolehexsigns.com for extensive info about this talented artist. Eric learned his craft from his father Johnny by first cleaning cans and making disks then painting signs and, finally, painting barns. Johnny Claypoole created booklets explaining the art he loved. The following information was taken from the booklet entitled “Johnny Claypoole—Hexologist—Pennsylvania Dutch Folk Artist. 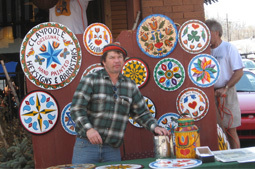 Nearly all cultures have had counterparts in the Pennsylvania Dutch Hex sign. There have been etchings or paintings on the walls of caves; statues, some of whose meanings eluded us to this day; special types of architecture; even brightly colored jewels or necklaces—all talisman of a sort. Hex signs are apparently an extension of the old German style of “fractur art.” Beginning in the sixteenth century, special documents such as birth certificates, and favorite possessions such as the family Bible were often decorated with this special calligraphy. Probably such elaboration was originally an outgrowth of fine penmanship. Before the popularity and general accessibility of the printing press, considerably more merit was attached to the artist who could print with special style and distinctiveness. It’s not difficult to imagine one of these artists, with an especially fine hand, deciding with a flourish that his work needed a more dramatic personal touch and adding a few special decorations. Even the earliest examples of “fractur art” show a marked similarity to the general style still used by Pennsylvania Dutch artists, symbols like brightly colored birds and flowers, and that same broad, flat style. Historically speaking, “fracturing” was a short-lived process in Europe. But the German immigrants who brought it to this country kept it central to their new culture, using it to decorate all sorts of their possessions, from trivets to tombstones, and finally expanding it to hex signs. In fact, so central did it become, that today hex signs and the Pennsylvania Dutch are almost synonymous. Perhaps it isn’t just the colors that one may respond to, perhaps it’s the symbols themselves. Superficially: the tulip represents the Holy Trinity; hearts, love, marriage and related affections; distlefinks (goldfinches) and shamrocks are good luck symbols. The mighty oak stands for strength. The eagle signifies courage, rosettes, prosperity and general good fortune; the sun and rain, fertility. All of these symbols represent things most basically and universally sought, today as well as two or twenty centuries ago. Now, just as the symbols themselves were transcribed from the subconscious of artists—as all art must ultimately be. Perhaps we receive them the same way. Perhaps the symbols touch our subconscious as subliminally as the colors do our emotions; not as dramatically as we may respond to an especially glamorous sunrise, but in the same general way. The Pennsylvania Dutch influence on the Lehigh Valley shines through in any number of ways: the food, the festivals, the language. A part of the culture's very soul, however, are hex signs -- the brightly colored circles that are most authentic when painted on barns but also are very popular on decorative wooden discs. Few people realize that eastern Berks and western Lehigh counties are the epicenter of the indigenous folk art form. Though there are a few in Lancaster County, they are exclusive to the Pennsylvania Dutch even there, and have nothing to do with Amish culture, says Don Yoder, co-author with Thomas E. Graves of ''Hex Signs: Pennsylvania Dutch Barn Symbols & Their Meaning'' (Stackpole Books, second edition 2000). ''Hex signs and Amish don't mix,'' he says. The Amish and Mennonites are two distinct, smaller groups included in the much larger category of European immigrants called the Pennsylvania Dutch, or Pennsylvania German. The term ''Dutch'' once covered people who were German or Dutch. Because of their somber dress, the Amish and Mennonites are sometimes called the ''plain'' Dutch. The ''fancy'' Dutch are mostly Lutheran and Reformed Church members. Amish barns typically are white and trimmed with green. They display no ''fancy'' decoration whatsoever, says Patrick J. Donmoyer, a student at Kutztown University majoring in art and minoring in Pennsylvania German Studies. His honors project this summer involves cataloging all the barns with hex signs in Berks County. Pennsylvania Dutch barns usually are red, owing to the low price and easy availability of the pigment just after the Civil War, says artist Eric Claypoole, who learned to paint hex signs by watching his father in the family's Greenwich Township home. Each symbol has a meaning, Claypoole explains: Hearts stand for romance and love of mankind, distlefinks -- stylized goldfinches -- signify abundance (but with eyes looking backward toward Germany). Snakes symbolize temptation. The Pennsylvania Dutch decorated everything with these symbols, furniture, birth certificates, even Bibles, he says. The concept of using the symbols for good luck or to ward off evil was publicly introduced in Wallace Nutting's 1924 book, ''Pennsylvania Beautiful,'' where he called the designs ''hexafoos,' ' or witch's foot. He coined the ''hex sign'' moniker for the images that had previously been known simply as schtanne and blumme, stars and flowers. Claypoole breaks a sly smile when asked if he attaches any meaning other than decoration to his work, probably the same smile generations of farmers gave before they answered, ''Yuscht fer schee'' -- just for nice, the answer he always gives. Yoder, whose book is still the go-to source for information on hex signs decades after it was first published, plays down their mystical properties. He does, however, acknowledge the designs were used on the underside of furniture, the backs of mirrors and on paper rolled into scrolls that homeowners inserted into holes drilled into door frames and window lintels (with the hope that they would protect their houses).
' ''But use these designs on barns to keep witches away? No!'' Yoder writes. He also writes that the story of hex signs still is being written. At age 22, Donmoyer is poised to be among the prime champions who continue the story. He lectures on the meaning of ''hexerei'' (hex signs) and continues to dig deep into their rich history. Some of the symbols, he says, date back to Norse, and even pagan, art. And it is no coincidence that the hub of hex sign activity is here rather than, say, New York or New Jersey. Donmoyer notes hex signs might be for more than just decoration and there could be a link to powwowing, a Pennsylvania German practice of healing using a core group of prayers. The practice was driven underground, where it remains today. Statements by other hex sign experts that the signs couldn't have mystical meanings because they're so public and out there for the world to see are misleading, Donmoyer says. While many can be seen from main roads, many are painted on the other side of the barn, which only could be seen by the family, he says. Protecting a barn -- the center of a farmer's life and livelihood -- from witches, even if they were only people who were very attuned to animals or nature, may or may not be whimsical. ''But witches were not the only reason to protect a barn,'' he says, referring to theft, fire and disease as other tragedies that could befall a farm or a home. Although the exact meaning of hex signs may be known only to the farmers who painted them so many years ago, they are interesting and worth studying, he says. 6-petal rosette: faith, fertility, protection from harm. One of the most common symbols, it is said to be one of the most ancient.